A Srebrenica moment in Syria? 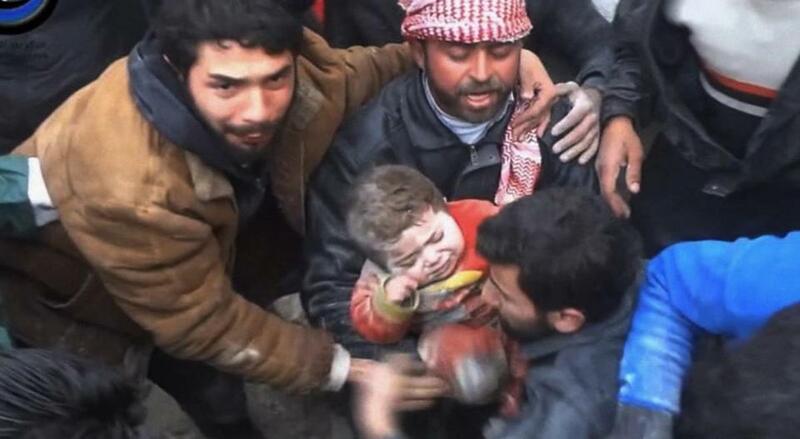 A girl was pulled from the rubble of a building in Aleppo, Syria, after it was bombed by the government last month. As the savage killings and stratospheric refugee numbers in Syria continue to climb, a key question emerges. When will the United States and other global powers experience a “Srebrenica moment,” when they can no longer stand on the sidelines and resolve instead that they finally have to act? That is what happened at the climax of the Bosnia war nearly 20 years ago. When the Bosnian Serb army murdered more than 8,000 Muslim men and boys in the United Nations safe haven of Srebrenica in July 1995, it was the worst massacre in Europe since the Nazi era. Those killings shocked and shamed Western leaders who had resisted decisive intervention until that point. I was State Department spokesman at the time and can attest to the collective guilt felt by officials in the United States and Europe, particularly over our inability to protect innocent civilians from a marauding army. When the Bosnian Serbs bombed the Sarajevo marketplace six weeks later, President Clinton and European leaders had had enough. They ordered a NATO bombing campaign. Together with Richard Holbrooke’s brilliant diplomacy, it led to a ceasefire and the peace accord at Dayton. As the UN’s listless Geneva talks on Syria reconvene this week, world powers are passive, disunited, and lacking the collective resolve that ended the Bosnia war. But the latest estimates of the Syria carnage should make us reflect on the human cost of our indifference. Over 130,000 Syrians have died since the war began in 2011. A shocking 9.3 million Syrians (in a country of 22.4 million) are refugees. They have lost their homes and jobs and are on the run inside and outside the country to escape the vicious fighting. Aleppo, Homs, and countless other cities suffer under the siege of heartless artillery and air assaults against civilians that maim and destroy at will. There are no easy answers to the Syria crisis. A US-led ground invasion would require something on the scale of the 1991 Gulf War — hundreds of thousands of troops. That’s not in the cards for a president, Congress, and public emerging from two major wars since 9/11. Russia and China continue to shield Syrian President Bashar Assad from international pressure at the UN, going so far as to object to proposals to facilitate the delivery of humanitarian aid. For now, the main, and mainly vain, hope is UN-led talks for a ceasefire and transition from Bashar Assad’s rule. At its current languid pace, that could take years to materialize. Washington finds itself in an uncharacteristically weak position to drive events in Syria. President Obama has taken force off the table, refusing to strike last September following Assad’s use of chemical weapons against civilians. Obama has still not provided effective, lethal support to moderate rebels or threatened strikes on Assad’s air force if the brutal killings continue. As a result, the United States lacks the leverage and credibility to intimidate Assad. The administration plods along the diplomatic path, remaining a responsible contributor of humanitarian aid but lacking the strength to produce a solution on its own. The one country that could make a decisive difference to stop the fighting is Vladimir Putin’s Russia. But Putin, aligned with Iran’s Revolutionary Guard and Hezbollah, prefers to run arms to the Syrian government and serve as Assad’s de facto lawyer in Geneva. Of course, Putin’s attention this week is elsewhere. His $50 billion campaign to rebrand Russia at the Sochi Olympics began with last Friday’s lavish opening ceremonies. But where was the Russian protest in the following days when Syrian women and children fleeing a besieged Homs were killed by Assad’s blistering attacks? This glaring gap between what Putin wants us to see in Sochi and the reality of his callous disregard for Syrian lives is obvious. But even Putin reached a new low on the hypocrisy meter over the weekend when the Russian Foreign Ministry solemnly asked “all parties involved in armed conflicts” to adopt an “Olympic truce” for the period of the Sochi Games. Putin doesn’t want the world to be distracted by bloody Syrian atrocities while the Sochi games are underway. He will, without doubt, refuel Assad’s machine of hate and destruction as soon as they end. Putin will never reach a “Srebrenica moment” on Syria. That leaves the rest of us to consider once more — how many more lives will be claimed by Syria’s ceaseless civil war before we are finally shamed to stop the killings? Nicholas Burns is a professor of the practice of diplomacy and international politics at Harvard’s Kennedy School of Government. Follow him on Twitter @rnicholasburns.